Karen Pipkin, left, accompanied one of her sons, William, 5, through the finish line yesterday at the Steve Favela Memorial Keiki Fun Run at Holomua Elementary School in Ewa. The run and fair honored HPD officer Favela, who died from injuries sustained in a crash last year. Despite the upcoming anniversary of her husband's death, Barbara Favela was all laughs and smiles during the fun run and fair she hosted yesterday. Police officer Steve Favela died Nov. 26 last year after injuries sustained in a motorcycle crash while escorting President Bush at Hickam Air Force Base. Planning for the fair has been a big part of her family's healing process, she said. "It was everything and more than what we wanted," the 35-year-old widow said. "I think I accomplished what I sought to do -- to give us something to smile about." 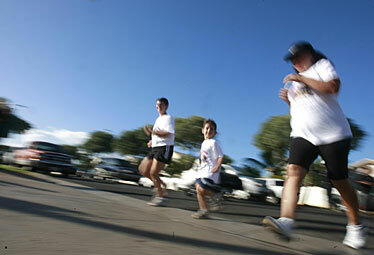 About 500 people showed up at Holomua Elementary School to participate in a run yesterday morning. Afterward, there was a fair with booths from local law enforcement as well as the U.S. Coast Guard, which her husband joined before becoming a police officer. "I had dreams of it being 500 runners, but I thought it'd be more like a hundred or two hundred," she said. "I was so overwhelmed at the support." Aiea resident Gary Sheridan brought his two sons to the run. As a former firefighter, Sheridan said, he knows the dangers of public service and thought the fair was a positive thing to get involved in. "I'm close with a lot of firefighters and officers," Sheridan said. "I thought it'd be good to come out. It's really touching." The event raised $6,000 for Holomua Elementary School, a campus two of Favela's children attend. About $2,000 also was raised for the Cole Academy, which another son used to attend. Holomua Elementary Principal Norman Pang said he hopes to use the money for community activities and the school's science research center. "Her husband was very involved with the school," Pang said. "He always helped us with something we have called the ohana fair. ... We will do anything for them because her husband really did a lot for us." The fallen officer's unit also came out to support the event. "We're a close-knit unit," said longtime friend Boyce Sugai. "We go up there, pay our respects and talk story at his grave site. ... He was the police's finest." The widow said she is looking forward to getting some rest after several months of working toward yesterday's fair. She said she's not sure what will happen now that the fair is finished and as the anniversary approaches. "I think it's still going to be difficult no matter how positive we try to be," she said. "The pain never goes away, it's always there. We just learn how to deal with it, do positive things and focus our energies somewhere else."